Background: Hypertension is one of the most important causes of mortality and morbidity in the geriatric age group. Objective: The objective was to study the magnitude and correlates of hypertension among geriatric women in a resettlement colony of Delhi. Materials and Methods: A community-based, cross-sectional study for the duration of 1 year was conducted among 512 geriatric women (≥60 years). Demographic characteristics and behavioral risk factors were determined by interview, and the participants underwent physical examination (blood pressure, height, weight, and waist circumference). Chi-square and unpaired t-tests were employed to study the association between risk factors and hypertension followed by multivariate regression analysis. Results: The prevalence of hypertension was 16.01%. Age, marital status, socioeconomic status, financial dependence, tobacco and alcohol use, physical activity, coexisting diabetes, body mass index, and waist circumference were significantly associated with hypertension on univariate analysis. In multivariate analysis, tobacco use, coexisting diabetes, and obesity were significant explanatory variables for hypertension. Conclusion: This study identifies some of the major factors associated with hypertension in geriatric women. Therefore, community-based approaches for improving awareness regarding hypertension and its risk factors and lifestyle modifications are essential to reduce the burden. Background: Establishment of a cancer registry is the first step in cancer control, and population-based cancer registries (PBCRs) are considered the gold standard for providing information on cancer incidence and mortality at population level. Materials and Methods: Earlier surveys reported a high prevalence of cancer in Punjab state. 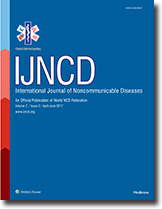 To address this issue and to provide reliable data on cancer incidence and mortality, four PBCRs were set up in Punjab and Chandigarh in year 2013 covering a total population of 4.5 million with PBCR Chandigarh and SAS Nagar, predominantly urban (covering 2.9 million population) and Mansa and Sangrur, predominantly rural (covering 2.6 million population). 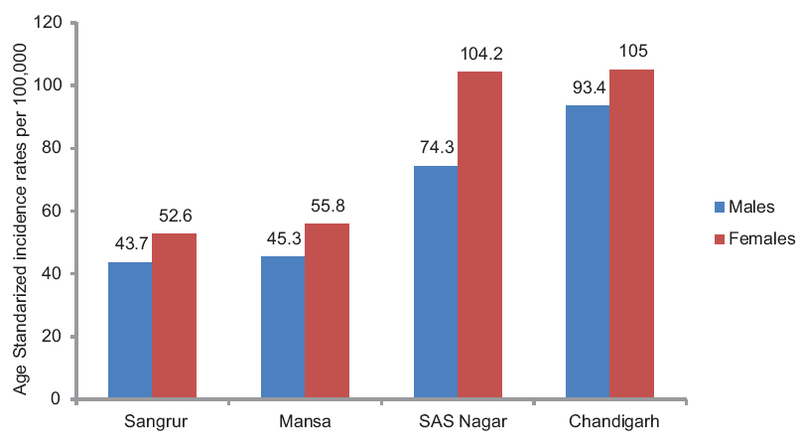 Results: Among males, Chandigarh and SAS Nagar have the age-standardized incidence rates (ASRs) of 93.5 and 73.5/100,000, respectively, whereas PBCR Mansa and Sangrur have age-standardized incidence rates (ASIRs) of only 45.3 and 43.7/100,000, respectively. Similarly, in females, PBCR Chandigarh and SAS Nagar have the ASIRs of 105.0 and 104.5/100,000, respectively, which was almost 2 times that seen at PBCR Mansa (55.8/100,000) and Sangrur (52.8/100,000). The incidence of breast cancer in females was 4–5 times higher in urban registries as compared to rural ones, whereas incidence of lung cancer was 4–7 times higher in urban registries. The most common cancer was lung cancer among males and breast cancer among females at PBCR Chandigarh and SAS Nagar, whereas it was esophagus among males and cervical cancer among females at PBCR Mansa and Sangrur. Conclusion: There were wider urban–rural differences with respect to incidence and pattern of cancers among the four registries which may be due to urbanization, lifestyle, and environmental factors which need to be explored further. Cancer incidence and pattern of cancer in Punjab are comparable with rest of the country.